Thanks to the assistance of the people who reported issues, we have identified and fixed the causes of Windows 10 crashes in ArtRage 4. Update your copy of ArtRage 4 through the member area to get the latest version. ArtRage Lite is also fully compatible with Windows 10.
check this forum thread for the latest information. Once we have diagnosed the issue, fixes will be rolled out in future updates to the program. If you are considering purchasing ArtRage 4 and concerned about its compatibility with your device and operating system, we recommend trying the demo first, as any issues will show up there. If the demo works for you, the full paid edition will too. ArtRage is fully compatible with Windows 10, but your graphics tablet may not be yet. ArtRage 2, 3 and 4 will work properly on Windows 10, but users may experience problems due to their graphics tablet drivers not yet being fully compatible. If you are experiencing issues, or depend on ArtRage, we recommend against updating to Windows 10 until your tablet company officially supports Windows 10. Wacom’s tablet drivers do not currently officially support Windows 10 and it appears that there have been problems in some other applications with them as well. Applications that do not support the current Windows tablet standard (Realtime Stylus) and instead only support the older Wintab standard may not experience these issues. The latest Wacom driver is version 6.3.13w3. This driver works on our test devices, and if you are experiencing problems, we highly recommend installing, or re-installing, it while Wacom revise their drivers for the final released version of Windows 10. Download the driver from Wacom – Do not install it yet. Uninstall the current Wacom driver. Rebooting is extremely important as not doing so can cause driver issues when old files are not properly removed before installation. Once you have done this you could also try the following in the Input section of the ArtRage Preferences Panel. Turn off ‘Use Realtime Stylus’. Turn off ‘Use Touch Input’. 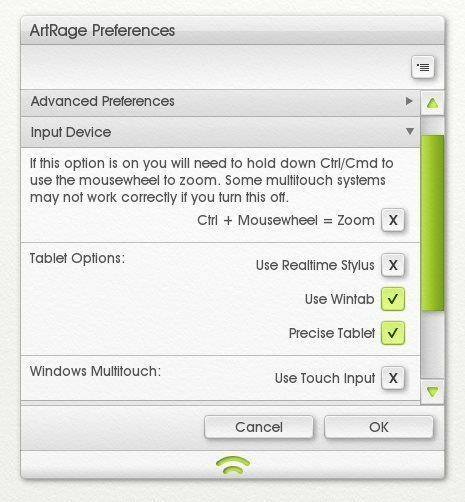 Go to Edit > ArtRage Preferences > Input Device to view these options. This prevents ArtRage looking for Realtime Stylus input and may also help while we wait for a driver revision. If none of the above suggestions help, you can also uninstall your tablet drivers completely, and use ArtRage without pressure sensitivity or other additional features for a short period. If you still experience problems after that, then the issue is not your drivers, and you should contact us via our tech support (though so far, all problems have been caused by the drivers). We are looking into options to improve the situation for users, but we recommend waiting for updated driver support in the meantime. You can also find Win 10 information in the forums.